Robert Suderburg (b. 1936) was born in Spencer, Iowa. He studied composition with Paul Fetler at the University of Minnesota (1953-57), Richard Donovan at the Yale School of Music (1957-60) and George Rochberg at the University of Pennsylvania (1964-66). After having taught and conducted at Bryn Mawr, the Philadelphia Academy of Music, the University of Pennsylvania and the University of Washington, Suderburg was appointed Chancellor of the North Carolina School of the Arts in 1974. He was the recipient of numerous awards and commissions including two Guggenheim Fellowships. As a conductor and pianist, he was very active in the performance of new music, especially in his role as co-director of the University of Washington Contemporary Group (1966-74). From 1985 to his retirement in 2001, he taught at Williams College in Massachusetts, and was chair of the Music Department from 1986 to 1995. 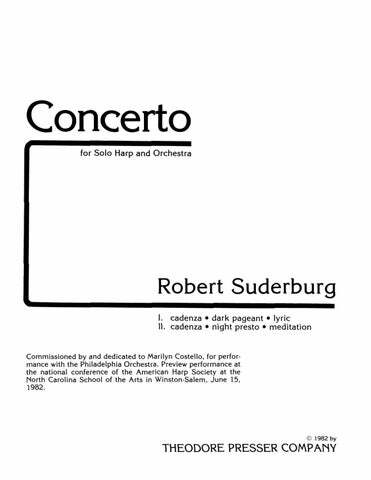 Suderburg’s early works were serial (he did his dissertation on Schoenberg) but he abandoned twelve-tone procedures in the late 1960s, a move which allowed his music’s inherent romanticism and lyricism to blossom. His harmonic and melodic language became primarily modal with particular emphasis on Phrygian and Lydian elements. There is a striking stylistic consistency from work to work, exemplified by his preference for harmonies derived from the tetrachords E-C-F-A and E-C-F-B, and the frequent recurrence of specific motives : the rising minor ninth, for example. He occasionally incorporates theatrical gestures or draws on vernacular styles in the manner of Ives. Above all, Suderburg’s works reflect his belief that music should not lose touch with its origins in song, dance and ritual. for Mixed Chorus, Brass Ensemble and Audience Participation 12:00 SATB; 2Hn. 3Tpt. 2Tbn. 30:00 4 4 5 4 – 6 4 4 1; Timp. Perc. Pno. 2Hp. Str. 20:00 3 3 3 3 – 4 3 3 1; Perc. Hp. Str. for Soprano, Tenor, Mixed Chorus and Instrumental Ensemble 33:00 Solo Sop., Solo Ten., SATB. ; 2 2 3 2 – 2 2 2 0; 2Perc. Pno. 25:00 Solo Hp. ; 4 3 3 3 – 4 3 3 1; Timp. 3Perc. Str. 19:00 Solo Perc. ; 4 3 4 3 – 4 3 3 1; Timp. 2Perc. Hp. Str. for Piano and Orchestra 25:00 Solo Pno. ; 3 3 3 3 – 4 3 3 1; Timp. Perc. Hp. Str. for Solo Voice, Solo Instruments and Chamber Orchestra 24:00 Solo Vx. ; 1 1 1 1 – 2 0 0 0; Str. on the Revelation of St. John, for Soprano and Chamber Orchestra 18:00 Solo Sop. ; 1 1 1 1 – 1 1 1 0; 2Perc. Vln. Vla. Vcl. Cb. Pno. for Tenor and Chamber Orchestra 12:00 Solo Ten. ; 2 0 1 0 – 2 3 0 0; Pno. Vcl. Cb. This was a highly impressive example of well-crafted music-making. The piece itself has a haunting, other-worldly lyricism and it was handled beautifully by its players. Each movement, notably the second, demonstrated with unusual clarity that music does not have to have a tonic and a dominant to have a beginning, a middle and an end. This new work held its own with the now classic songs of Webern and Dallapiccola. …the movements actually did move, interestingly and with a strong amount of urgency… the ‘motion of frenzy’ turned out to be a genuine tour de force that the players executed with astonishing skill. …slid back and forth between irony and burlesque… The spirit of Ives presided over the piece, which quoted snippets of both ancient and recent popular tunes… A lighthearted piece, it nonetheless put the trombonist through the hoops. …the work is highly melodic, and eclectic in its recollection of jazz and distinctly American gestures… This music is varied, expressive, boldly colored, often songful; it surprises its listeners with combinations of timbre. …a remarkable achievement: a big colorful, vibrant, and consistently fascinating composition which is surely an important contribution to contemporary musical literature. The concerto might be described as neo-Romantic; it is filled with passion and fury, and it contains some passages of real beauty. Mr. Siki performs prodigies of virtuosity. …the cantata builds up blocks of sonorities as intensely contrasting in color as the vibraphone and double bass… The whole work seethes with a vitality that is rarely heard in any cosmopolitan center today. The music has a strong and driving quality with the soprano contrasted against the tonal masses of the orchestra. Sometimes frenetic, the cantata gained a dramatic intensity, which grew almost urgent. Robert Suderburg’s Cantata No. 2 for tenor and chamber orchestra… is brilliant, its inspiration unflagging. It is a vision, a passion, a conviction in sound. Every movement unleashes a fury of energy that is nevertheless intensely controlled. …so dramatic in their contrast that they were reminiscent of the avant-garde Karlheinz Stockhausen.